The first is that when you get your head around the fact that a piece of art a ten year old aspect produced isn't any "worse" or of any less merit than something the 50 year old aspect has produced, this of course means that whatever the 50 year old aspect is creating can't be bettered by any potentially 70 year old aspect, twenty years in the future, and whatever they're doing now, STANDS - in perfection, forever. That gives you a very strange sensation when it comes to creating current pieces of art. Freed from the competition against past aspects - "trying to do better in order to prove that I'm evolving" - one is free to do the art of this time, what is relevant/interesting/important right now, without looking forward, without looking back, without stress, without regrets. Perfect. By not disrespecting the aspects of the past, there is a freeflow of energy across the entire timeline and creativity becomes something different as each aspect expresses their unique fascinations and insights and adds them to something that is more than the sum of its parts - the overall body of work. As you get older, and although the art itself never gets any better, you do get better at the mechanics of whatever art thing you're involved in. A case in point is the digital "restoration" - read "recreation from scratch!" 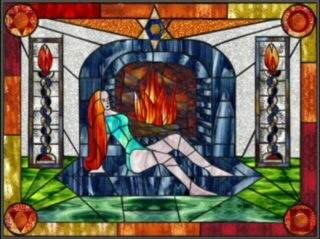 - of the Isca By The Fire stained glass design from 2002. 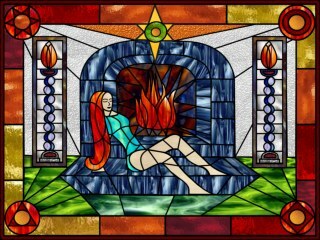 At the time my aspect made this piece of art, they were deeply involved with In Serein; and when the thought arrived, the desire, to make something for In Serein, the aspect chose the moment when Lord Lucian saw Isca by the fire at their first meeting and fell in love with her. The aspect set to work and took nearly a week to create a vector drawing (no mean feat) using one of the Art Solutions movements, to create shapes and place them in such a way that they produce "The Click." She was very happy with the results and at the time, put a small jpg on the web. Computers were slow still and most of us were on dial up; so any image over 20kb was most frowned upon - are you old enough to remember that? Anyways, so there was the inevitable frying up of a hard drive and the original was lost; much wailing ensued. Fast forward to 2011, and the new In Serein website. The old one contained a reference to the Fire design and the teensy jpg; the current aspect looked at it and wondered if it would be ok to re-make that. If it would be ok to spend that much time on something from way back when. The answer was a feeling and the feeling was, "Yes, of course! It's one of my favourite things of all times, for so many different reasons ..." so my current aspect sat down, took a deep breath and set about re-creating the entire image from scratch. Interestingly, instead of a week, it took just over 12 hours in all, two sessions, to re-create the entire image. It's not quite the same as the original; perhaps it's not quite as "good" but then it can't be, only the original can be itself. However, it's a good effort by the current aspect and the rest of the aspects are happy with it too; the image and what it represents is no longer "lost" and that's nice too. And it is also interesting to muse on the fact how much faster, more confident and more accurate the execution of the movements have become over the last decade to make it easier and faster now to do such things. Never ... can't be done. And that's simply wonderful to know.